We love Easter and want to offer you our Easter promotion: Buy one Zeazoo pair of shoes and get a second one with a 25% discount. IMPORTANT: Products on sale are included. The promotion can be combined with loyalty and referral vouchers only! If you put more than two products in your shopping cart, the voucher will apply on one product (with the lowest price) only. It is about time to take care of our dads! We are very happy to introduce Zeazoo new models for MEN - PELICAN, offered in sizes EU 39-47 and NEPTUNE, offered in sizes EU 39-46. Now you can have them with 15% discount! Celebrate it with a 10% discount on all Zeazoo styles! 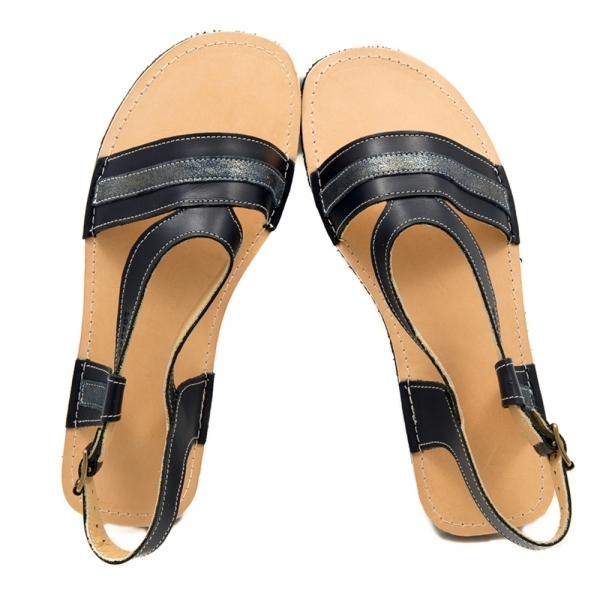 Celebrate this wonderful day and please yourself with a comfortable and stylish pair of shoes or sandals. Get a 10% discount on all Zeazoo ladies styles! The models included in this promotion are: Siren, Coral, Anemone, Marlin, Kiwi, Fox, Mary Jane and Dingo all in sizing EU35+ and Impala. Let's start it with a 10% discount on all Zeazoo products in the period of January 3 through January 10, 2019! IMPORTANT: Products on sale are excluded. The promotion can be combined with loyalty and referral vouchers only! *The production term for orders made in the period of this promotion will be 3-5 working days! Black Friday is a weekend long with Zeazoo! Get 15% off your Zeazoo purchase November 23 through November 25, 2018! IMPORTANT: The promotion can be combined with loyalty and referral vouchers only! Products on sale are excluded. *The production term for orders made in the period of this promotion will increase to 10 working days! Happy World Children’s Day! Celebrate this day with Zeazoo on November 20 and get a 10% discount on all BLUE Zeazoo products! Happy Halloween! Treat yourself on this spooky holiday to a 10% discount on our products' price. Validity: October 31 through November 2, 2018. You can add up to 3 (three) vouchers total per order. 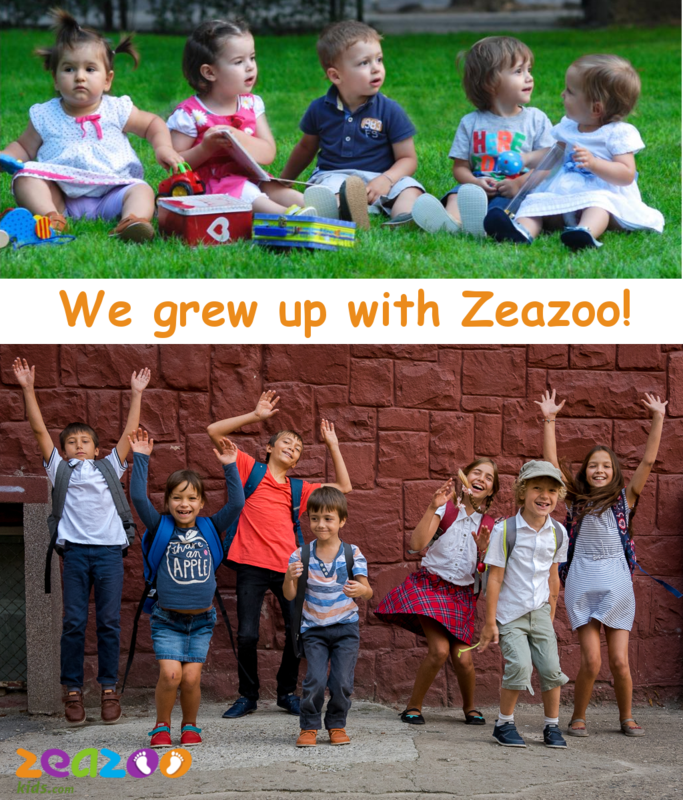 We are now beyond Zeazoo's first 7 years of growth. It is today, September 17, 2018 that we turn 7 years old. Our lucky number being 7, we invite you to celebrate with us and get a 17% discount and the 7th product free. The 17% discount code HBDAY2018 applies to your entire order. The 7th product free discount code SEVENTH is applied to the lowest priced product in the cart. You can use both discount codes for purchases of 7 pairs and more. IMPORTANT: The promotion cannot be combined with other vouchers and on sale products! And to reach 7 products in your cart, you need to add pairs of shoes, not insoles, laces or customisations. Shoes and slippers play a very important role in our kids' school and kindergarten life! Buy one pair of shoes, get the second one with 25% discount, including our On Sale products. Valid between August 1-15, 2018, 00:00 London time! IMPORTANT: The promotion can be combined with loyalty vouchers only! The voucher will apply on the lowest price product in your shopping cart. Make your kids happy by buying them Zeazoo shoes. To honor this happy holiday all our products will have 10% discount. NOTE: The promotion can be combined with loyal and referral vouchers only. Buy two products, get third one 50% off, including our "On sale" products, from the 21st of March till the 11th of April 2018 00:00 London time! The promotion can be combined with loyal vouchers only. If you put more than three products in your shopping cart, the voucher will apply on one product (with the lowest price) only. Get 10% discount on every pair of shoes you buy, including our "On sale" products, from 25th till the 29th March 2018 00:00 London time! The promotion can be combined with loyalty and referral vouchers only. 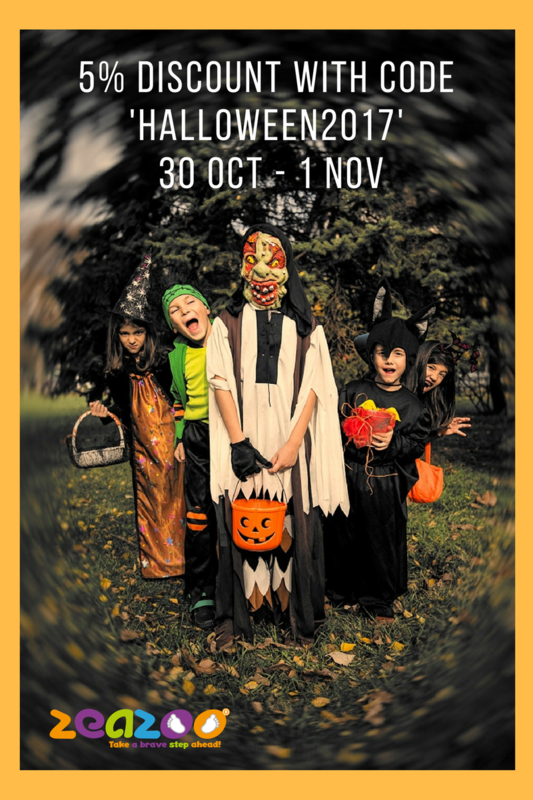 Celebrate Halloween with 5% discount -> 30 OCT - 01 NOV.
Use 5% discount code: Halloween2017 until 00:00 London time ot the 2nd of November. It is also highlighted on the checkout page, just click on it when you get there to use it. This discount code can be combined with referral and loyalty vouchers only. We are not getting older; we are getting better! Read our story for the past six years below. As usual, we make the presents for our birthday. This time, we are happy to announce that you can use a 5% off on all your purchases until 2017/09/19. The voucher code you can use is 6YEARS. The participation in the Easter Survey about Zeazookids products Usage and Attitude will earn you a 10% discount. To be eligible to participate in this survey you should have a child in the age group 0-14 years old. We will use this survey to improve our products and models according to your needs and recommendations. ZeaZooKids will publish an anonymized charts based on the results. You will receive a discount code for 10%, for your next order within 24 hours after you submit the survey. Expiration of the code -> 20th of May 2017.This discount code can be combined with referral and loyalty vouchers only. This survey ends on the 25th of April! Say hello to the Spring season. Use a 10% discount on all products, including our "On sale" products until the 31st of March 2017! Discount code: SPRING until 00:00 London time. We turn 5 on the 17th of September 2016. Use 5% discount code: 5HB2016 until the 20th of September 2016 00:00 London time.